Wow, it was hot today. About 101 degrees where I live. Isn't it supposed to be fall already?? Guess what I had for breakfast?? Yes, I'm a meal repeater. I'm a big offender of it in the morning. I like what I like...what can I say?? 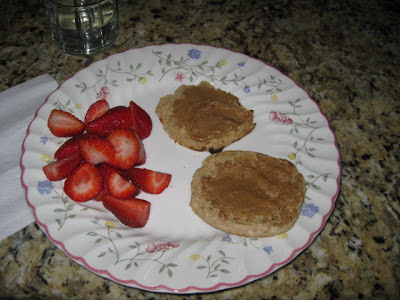 Multi grain English muffin with a tablespoon of almond butter (almost out! yikes!!! Who makes the best almond butter...need to buy more!) and a half cup of strawberries. Basically I plan breakfast around nut butters. After dropping the kids off at school, I went to spin class....we did 45 minutes of glorious spinning and 15 minutes of abs. I cannot seem to figure out how to get a calorie count on my new Garmin Forerunner heart rate monitor. It doesn't seem to calculate my calorie burn when I'm doing "inside exercise". I even turned the GPS off....any suggestions? I really miss seeing my calorie burn at the end of my workouts. My mom (who lives near Los Angeles) came to visit today. We did our usual: shopping. Didn't buy anything exciting today: just clothes for the kids and a birthday present for a friend's son. Lunch was at Bloomingdales and I forgot to take a picture of my glorious lunch: Salmon Caprese Salad. It's mixed greens with a piece of yummy salmon on top and all around it are tomato slices and mozzarella slices. I poured balsamic vinegar all over it and went to town. After shopping we came home and grabbed the kids and went to Tio Leo's for dinner. That's the place I told you about that has whole wheat tortillas! Bless them!!! I had about 4 tortilla chips and salsa. I usually don't touch them at all for fear of eating the whole basket but I was able to restrain myself tonight. I ordered the veggie burrito which has beans, rice and a little cheese in a whole wheat tortilla. 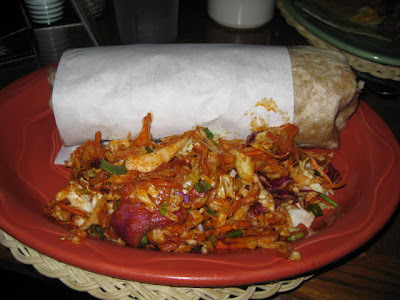 It comes with a Mexican cole slaw thing which I love. It's a oil and vinegar base not mayo. I topped the whole thing with tons of salsa and my beloved Cholula. I succeeded in putting quite a nice dent in it. And there you have it folks. Have a great night! I'm totally a repeat meal offender--I need to shake it up a bit! lol But AB on English Muffin is way too good to not keep having! I love Trader Joe's raw AB...I think it's the cheapest too...but Henry's fresh ground stuff is delish too.